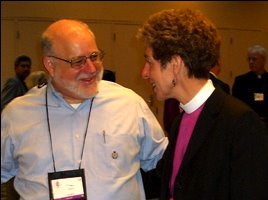 Former Episcopal Diocese of Lexington's Bishop the Rt. Rev'd Stacy Sauls spoke to the gathering of Episcopal House of Bishops meeting in at the Hilton Colón Hotel in downtown Quito, Ecuador. Recently appointed the Chief Operating Officer of 815, Bishop Sauls outlined his proposal to recommend a major restructuring of the Episcopal Church. It would include reviewing the frequency in which General Convention meets as well as calling for a Constitutional Convention before 2015. General Conventions are currently scheduled for 2012 and 2015. The proposed Anglican Covenant should come before General Convention in 2012 (with a possible re-reading in 2015) and a new Presiding Bishop should be elected in 2015. Bishop Sauls with Bishop Schori. Sauls gave his presentation during the Sept. 20 morning session of the Episcopal Church's House of Bishops Sept. 15-20 meeting being held at the Hilton Colón Hotel in downtown Quito. The model resolution would call for a special commission to be charged with "presenting a plan to the church for reforming its structures, governance, administration, and staff to facilitate this church's faithful engagement in Christ's mission…." Presiding Bishop Katharine Jefferts Schori and House of Deputies President Bonnie Anderson would appoint members to the special commission. The resolution would also call for a special meeting of General Convention before the 78th General Convention in 2015. The resolution, Sauls said, could be distributed at upcoming diocesan conventions or in committees to start the conversation. "This is a way of engaging the laity and clergy on the ground, not a bishop-centric thing," Sauls told ENS after his presentation. "We are asking the laity and clergy to have this conversation." Sauls' presentation, he explained, stemmed from conversations and discussions going back to the 2004 formation of the Budgetary Funding Task Force. It began with the question: "Why reform?" From there Sauls used eight separate slides to list the church's 75 commissions, committees, agencies and boards -- those he could readily identify, he said -- and another five slides to list the 46 Episcopal Church Center departments and offices, all of which have multiple reporting structures. And then, he said, there is General Convention, which has 46 legislative committees of the two houses, which meet together in another 23 cognate committees; nine provinces; and 110 dioceses. Sauls' next slide showed how the income earned by dioceses has declined in recent years. The Episcopal Church asks dioceses to contribute a percentage of their income to the denomination's budget, and thus revenue it receives from the dioceses has also declined. That decline is coupled with a decision made at the last meeting of General Convention (2009) to reduce the percentage of the so-called "asking." It was 21 percent in 2010, dropped to 20 percent this year and will decline another percentage point in 2012. In addition, the convention increased from $100,000 to $120,000 the amount that dioceses could exempt from their income before calculating their commitment to the denomination. As it stands in the current budget process, governance is funded first, Sauls said, and then asked, "What would happen if we reversed that priority, starting with mission?" (BB NOTE: It's not clear what constitutes "mission" since litigation expenses also seems to be identified as mission). In order to get a good rating from the Better Business Bureau, a nonprofit organization should spend no more than 35 percent of its budget on overhead, while the Episcopal Church, he said, spends 47 percent of its budget on such expenses. Ideally he added, the percentage spent on overhead should be closer to 15 to 20 percent. Such a budget, he continued, could be funded by the church's investment and rental income and by a one-percent contribution of congregational income, based on full participation. "One percent could fund mission and ministry at the church-wide level and leave more [money] for local mission and ministry," Sauls said. From there he offered four principles: engaging conversations aimed at reducing overhead; redistributing oversight responsibilities based on strengths; creating a linear rather than a top-down approach to engagement; and emphasizing local participation. Depending on how you look at it, he said, the fact that General Convention takes 7.6 percent of the church's resources is a major or a minor cost. Sauls went on to explain the estimated "total cost." General Convention costs the church $8.3 million plus another $353,000 to church center departments and $3.5 million to dioceses to send its deputation and bishops -- a total of $12.2 million every three years, not including the costs to individuals, he said. Reducing the frequency of General Convention to every four years would save 25 percent and every five years would save 40 percent, Sauls continued, adding that the length and size of the meeting, how business is presented and ongoing work also could be restructured to reduce costs. "to facilitate this church's faithful engagement in Christ's mission…." This made me laugh, and gag simultaneously. ECUSA has no engagement in the Mission of Christ...they are far more occupied with their own liberal piety, suing for property, supporting pro-abortion groups, and keeping their lock on the brand-name "Anglican" in the U.S.
Maybe their whole "restructuring" idea will mean that they cease calling themselves a "Chruch"...they haven't been one of those in at least a decade. How anyone that is remotely interested in Biblical teaching can stay within the walls of ECUSA is beyond me. You're on the Titanic...you already know how the story ends...and you've got your PB steering the ship into a heresy-ridden abyss. "I think the deck chairs would look better on the starboard side next to where that life boat used to be...". I always wonder a bit about straight line extrapolations. Given typical congregational size of 60 and average age in that same numerical range, should the term "tipping point" come up in discussions?